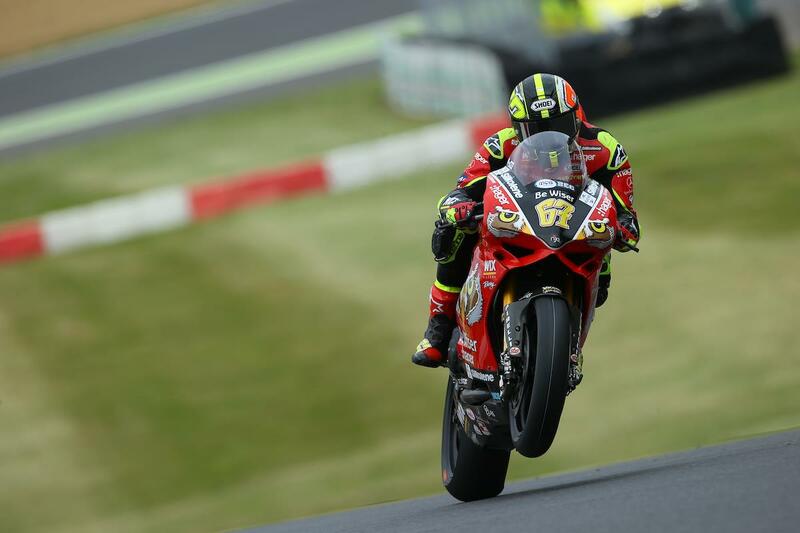 Shane Byrne led the way on the opening day of the sixth round of the 2017 MCE British Superbike Championship at Brands Hatch. The Be Wiser Ducati rider’s time of 1’24.904, under the race lap record, puts him 0.418sec ahead of rival Josh Brookes on the Anvil Hire TAG Yamaha. After topping the morning’s opening free practice, Byrne led the way until 20 minutes to go in FP2 before Brookes took control at the top, but having none of it, Byrne pitted for fresh rubber before pulling out almost half a second on the rest of the field. John Hopkins concluded a strong opening day third quickest for MotoRapido Ducati, ahead of championship leader Luke Mossey and Smiths BMW’s Peter Hickman. Leon Haslam was sixth as his team head to Brands after a nightmare test at Cadwell saw them sit out of the day with technical issues. James Ellison led the way for McAMS Yamaha in seventh, ahead of the leading Honda of Dan Linfoot and team-mate Michael Laverty, who continues to show improvements after a breakthrough during Tuesday’s Cadwell Park test. The returning Christian Iddon rounded out the top ten. It was a tough afternoon for Honda’s Jason O’Halloran, fifth quickest in the morning he was unable to set a time of note in the second session after tucking the front under braking at paddock hill bend early on. Bennetts Suzuki’s troublesome times with Sylvain Guintoli continued with the former World Champion placing just 14th on the opening day while team-mate Taylor Mackenzie languished in 23rd place. Glenn Irwin, who is returning from the nasty shoulder and elbow injury he sustained at Knockhill, was 22nd.